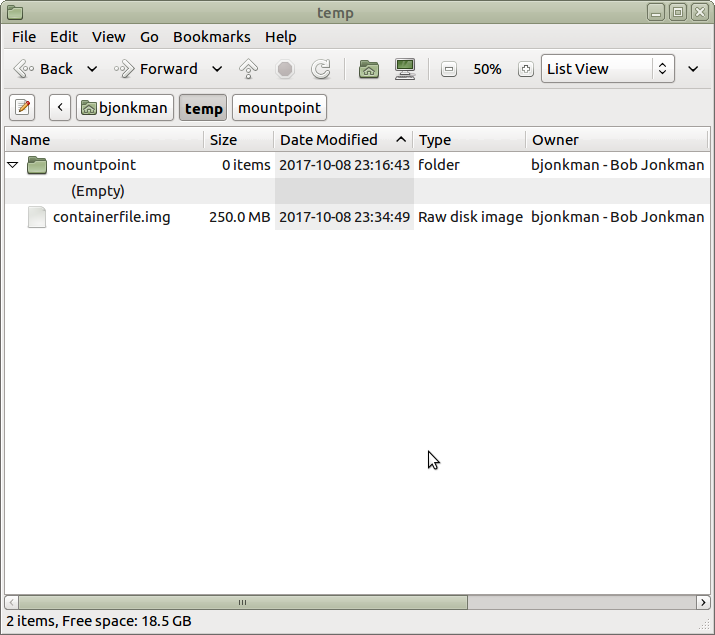 Inspired by The Linux Experiment, I want to create an encrypted drive in a file container using only the command line. This will overwrite data on containerfile.img irrevocably. Of course, the passphrase doesn’t show on the screen, not even as asterisks. That would give a shouldersurfer an idea of how long the passphrase is. It is a long passphrase, right? 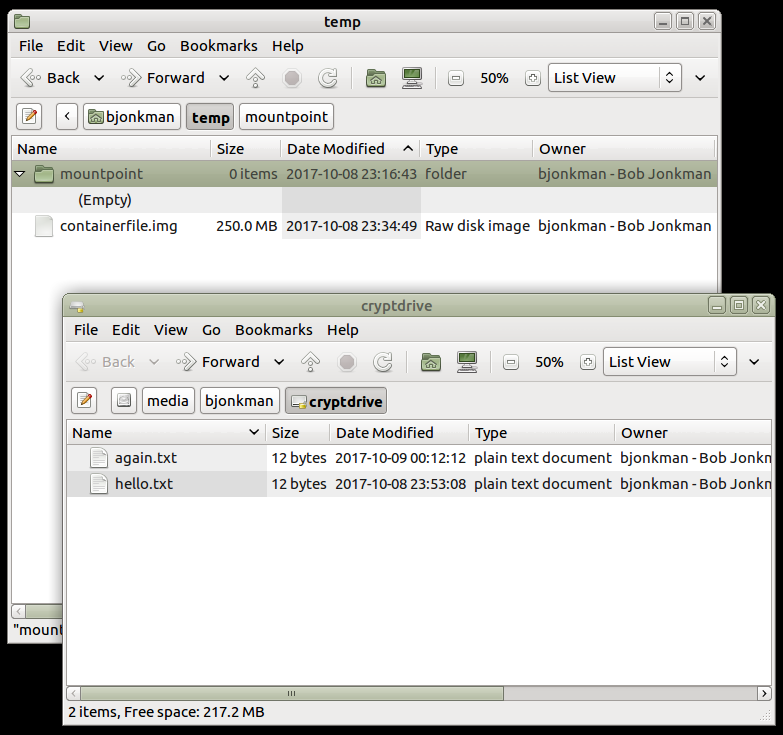 Note that the encrypted file system still belongs to root:root because we used the sudo command. Happily, this all works without elevated privileges; no sudo required. 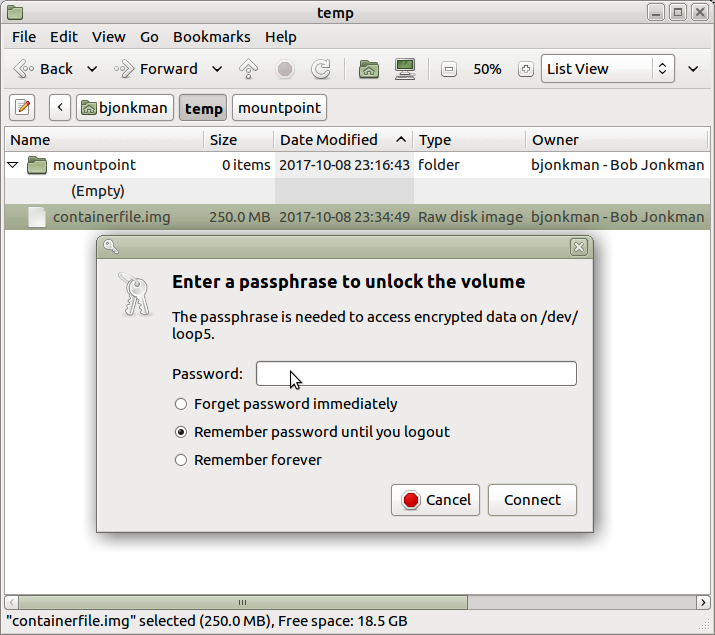 I don’t know how to open an encrypted file container using only command line tools without using sudo, nor how to launch Gnome Disk Manager in writeable mode just by doubleclicking — if you know, leave a comment or send me e-mail! In addition to the GNU/Linux Resources in Kitchener-Waterloo there are several other places to look online if you need support. Here’s a list of the GNU/Linux Resources I use. Do you have additions? Do I have errors? Leave a comment or send me e-mail. That’s Jeff, Sergiane, Raul, Ralph, Karim, Bob, and Henrique. Cutting cake is serious business! That’s David, Gord, Bob, Ralph, and Darcy. 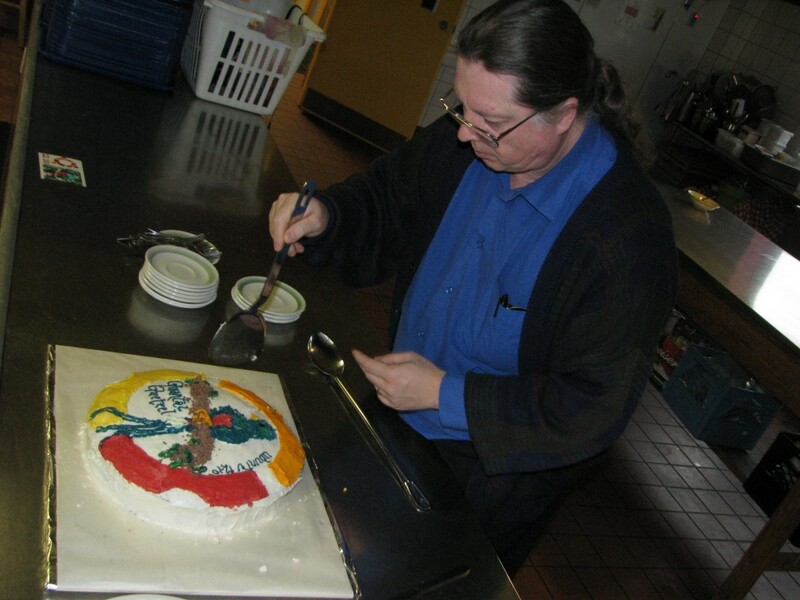 Many thanx to Paul for hosting and The Working Centre for the use of St. John’s Kitchen! Pictures taken by Laurel L. Russwurm and used under a Creative Commons — Attribution — CC BY license. Hello Everybodee! I’m happy to announce that we’ll be having the Kitchener-Waterloo Ubuntu Release Party for the version named Quantal Quetzal, v12.10 at St. John’s Kitchen this Saturday. 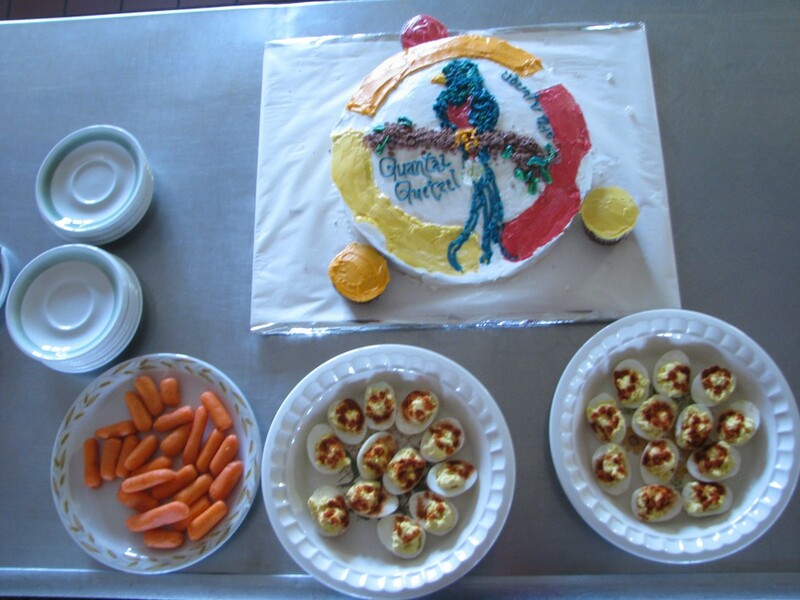 The best parties always happen in the kitchen. Although we won’t have access to the cooking facilities, bring along some snack food to share, maybe some blank DVDs, and your laptop or netbook. 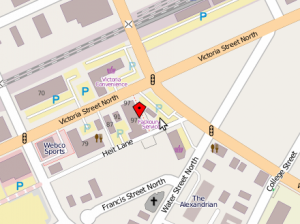 St. John’s Kitchen, 97 Victoria St. N.
Automobile parking is available through Heit Lane in the Worth A Second Look parking lot; bicyles can be locked to railings at the entrance to St. John’s Kitchen. People have asked me about GNU/Linux resources in K-W, so here are some of them, gathered in one convenient place. This is by no means an exhaustive list (yet). If you know of others, please let me know in the comments. The KWLUG mailing list for general discussion is where all the action is, along with a “Help” list for specific questions. Microblogging as @kwlug and !kwlug on Identi.ca and also @kwlug on Twitter. There’s a low traffic Ubuntu-CA-KW mailing list. Microblogging on Twitter as @ubuntuwaterloo and on Identi.ca as @ubuntuwaterloo too, with a group at !ubuntucakw. Some members can also be found on the IRC channel #ubuntu-ca-kw on Freenode.net. Ubuntu-CA-KW has regular Ubuntu Hours in Kitchener (first Friday of the month) and Waterloo (third Wednesday of the month) announced on Identi.ca, Twitter, and sometimes the mailing list. Again, the Ubuntu Canada mailing list is where the action is, but there is also a web forum and the Ubuntu-ca.org website. 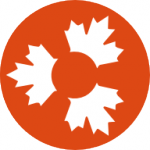 Check out the Ubuntu Canada events listing. 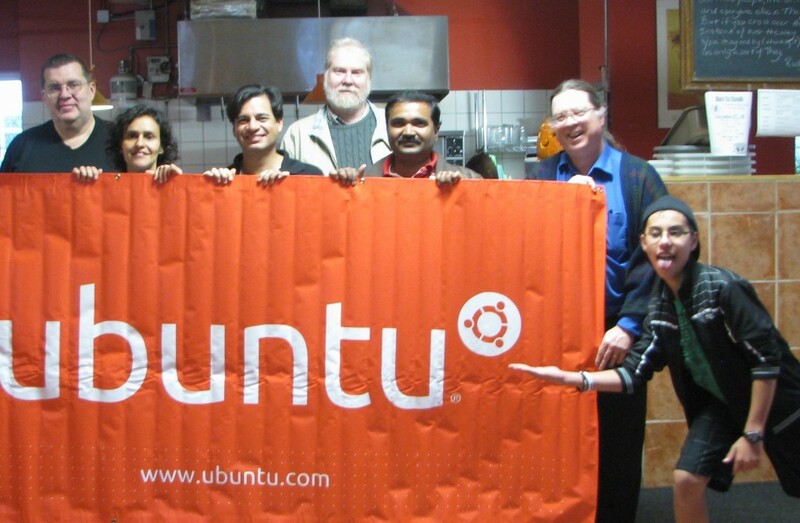 There’s an !ubuntuca group on Identi.ca, and many people can be found on the IRC channel #ubuntu-ca on Freenode.net. Computer Recycling at The Working Centre sells refurbished computers pre-installed with GNU/Linux, and offers a repair shop with staff and volunteers who are enthusiastic and knowledgeable about GNU/Linux. Every Saturday is Ubuntu Day: 10:00am to 4:00pm, Hours are Tuesday to Friday, 10:00am to 5:00pm, at 66 Queen St. S. in Kitchener (use the entrance on Charles St). You’ll also want to keep an eye on Kwartzlab, the local makerspace where many of the Ubuntu events are held. There’s a discussion mailing list for members and non-members alike. Visit the workshop on Tuesday Open Night, 7:00pm to 10:00pm at 283 Duke St. W., Kitchener. Also check the Watcamp calendar for other GNU/Linux and many other tech events happening in the Waterloo area. 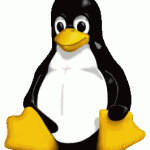 Image of Tux by Larry Ewing, copied from Wikimedia Commons. Permission to use and/or modify this image is granted provided you acknowledge Larry Ewing lewing@isc.tamu.edu and The GIMP if someone asks. 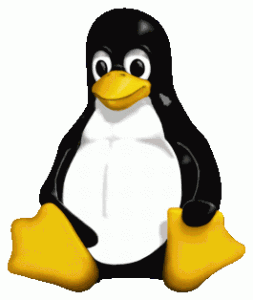 This is a list of lightweight GNU/Linux (or other free/libre OS) distributions. I’m specifically looking for a free/libre operating system that will run a Graphical User Interface on a 10-year-old laptop, 700 MHz Intel CPU, 256 MiBytes RAM (but 128 MiBytes would be better), an 8 GiByte hard drive and an 800×600 screen. If you know of any other lightweight distributions please leave a comment. Also please leave a comment if you can help fill out the chart – the distributions’ documentation is pretty inadequate when it comes to listing minimium system requirements. I expect this post to be a continuous work-in-progress. Added 14 June 2011: Thanx for the suggestions from @dwa, @headphonica, @darkestkhan, @flying_squirrel and @circuidipity, all added above. Added 17 June 2011: @schestowitz points me to a Linux Devices article on Tiny Core Linux. Added 28 July 2011: @chaslinux reminded me of The Working Centre’s distribution, WCLP. Added 4 August 2011:Just saw antiX mentioned on Identi.ca. Added 12 October 2013: @tekk writes: @bobjonkman If driver support isn’t an issue, maybe look at http://dragora.org . I’d also put slackware on the list for that, maybe freebsd as well?